March 2015 Gemini Horoscope predicts that this month is all about career and finance. Planetary power in the Eastern sphere increases after 18th. Do not worry too much about family and love life this month. Hence both your self-reliance as well as social grace is required to progress in life during the month. 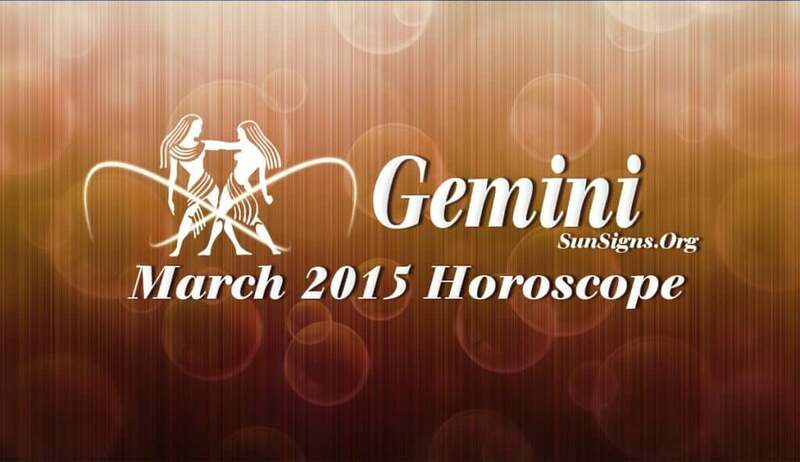 The Gemini career forecasts for March 2015 foretell that your career will be highly interesting but volatile. Lot of churning will be seen in your professional life and you should be prepared to accept the changes. Spectacular growth is seen for the Twins in senior managerial positions. Major organizational changes are likely and you may move to a foreign country to pursue your career. Business will be profitable. The financial predictions for the Gemini zodiac sign foretell that your money position will be stable during the month. Cash flow will be generous during the first few weeks of the month. Love will be blissful for the Gemini in March 2015. Relationships will be peaceful after all the excitement of previous months. You might even start dating again. Major decisions such as marriage or break up of relationships should be postponed to a later date. Relationships will move at a slow pace and should be allowed to develop smoothly. You can plan for a pregnancy this month. The March 2015 Gemini horoscope forecasts that plenty of stress will be the result of career related changes. You should try to relax as much as possible and conserve your energy to face the challenges in your life.